It was a day of reasonably good scoring here at Green Valley, where many of our Irish friends were playing their last game for this year before heading back to sunny Ireland. Declan Kelly was the man of the match, winning the A Flight with was a best of the day thirty eight points. Declan also did something which is becoming a bit of a habit as he again relegated Joe McArdle into second place, today by a margin of two points. Joe edged Russell Goldsworthy out of the runner-up spot on count back. 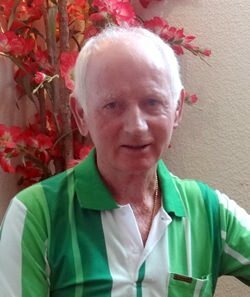 George Cullen, who is playing very steadily at the moment, took the fourth spot with thirty five and Allan Parker was fifth with thirty four. 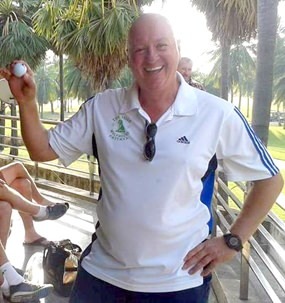 In the B Flight Gilbert Brossnan finished off his holiday in style by winning with thirty six points and Andy Galvin was second with thirty five. Frank McGowa took third wo further back and Ted Murphy, who is just starting to find his form, took the fourth place ahead of Michael Byrne on count back. We had three ‘2’s, with Alec Hoare, Russell Goldsworthy and Nick Caulfield recording one each. Another day of mixed scoring from both flights here at Mountain Shadow on Tuesday, with some excellent scores and the rest just mediocre at best. Nick Caulfield won the A Flight and also played the best golf of the day, going round in three over par gross to score thirty seven points, which on this difficult and tricky course is great golf. A long way behind in second place was Joe McArdle with thirty four points while John Baxter took the third place on count back over Bill Read. Ted Murphy has been finding his form lately and he certainly did it again today as he won the B Flight by a large margin with another excellent thirty nine points. This was Ted’s first outright win with us this year and he certainly did it in style as the next best score was seven points behind him. This was recorded by Shane Heavey who took second place while Theresa Connolly, who was playing her last game with us for this trip, again made the podium by edging a count back over Tony Dire. Nick Caulfield made it a very good payday indeed as he got the only ‘2’ of the day. We had a smaller group out today and played the B and A courses, this was our first time on B in a very long while as it had been closed for renovations and I have to say it is in excellent condition with excellent greens. It was actually the first time some of our group had ever played it and all we very happy with it and also with the A course, which was in great condition. Frank McGowan was the winner today with thirty seven points while Russell Gilroy took second place with thirty four. Declan Kelly was three shots further back to take the third slot and once again Declan beat Joe McArdle by a shot as he had thirty points to take the fourth and last place. We had no ‘2’s today. 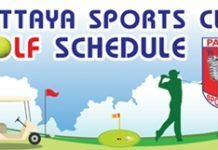 Note: The Tara Court Golf Group play every Sunday, Tuesday and Thursday, leaving O’Gara’s Bar and Restaurant in the Tara Court on Pratamnak Rd. around 10.00 a.m. Sign up either in O’Gara’s or ring Joe on 089 249 1364.